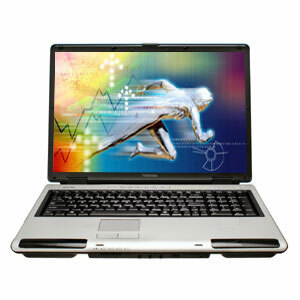 Toshiba Satellite P100 and P105 series of laptop computer has the functionality and features of a powerful desktop PC. Both series has similar specifications, with P105 has better configuration for graphics card. Toshiba P100 and P105 notebook PC features Intel Core Duo process with Intel Centrino Mobile Technology, 17″ 1440×900 pixel resolution diagonal widescreen WXGA LCD display with TruBrite technology, SATA hard disk, integrated 802.11b/g wireless LAN connectivity, Toshiba DVD SuperMulti dual layer plus DVD-RAM optical drive, instant-on entertainment with Toshiba’s Express Media Player, built-in harman/kardon speakers, built-in fingerprint reader, Type II PC Card slot, ExpressCard slot, 5-in-1 Bridge Media Adapter, i.LINK IEEE-1394 Firewire port and 4-USB ports. NotebookReview reviews Toshiba Satellite P100 laptop and concludes that Toshiba P100 series is a really nice home computer. It packs more punch than many desktops into a very small amount of space. With more than enough power for typical home computing tasks the P100 would be a fine choice as a family computer. Build quality is excellent and it does not get hot or loud. Its smart looks won’t look out of place in your environment. Value is a little tougher to measure. With its big screen and quality components the P100-J100 in particular seems to be a good value. Sci-Tech Today (link dead) reviews Toshiba P105 series laptop (modal P105-S6084) and concludes with rating of 4.5 out of 5 that Toshiba P105-S6084 Satellite notebook is a solid multimedia notebook that should meet most computing needs with aplomb. Good things are big and bright screen, plenty of memory and storage plus TV tuner. While the bad things are integrated graphics and very few installed programs. NotebookReview reviews Toshiba Satellite P105-S921 notebook and concludes that Toshiba finally gives us a true gaming laptop. After having huge 17″ multimedia monsters like the Qosmio, they now offer one of the top gaming performance to boot. Perfect for Lan parties, or just showing off to your friends how much faster your laptop is to their PCs! Good points for the laptop are powerful, beautiful evenly lit and crisp screen, built in IR remote, built in fingerprint scanner, USB ports on every side and multiple volume controls Integrated numpad. While bad points are no subwoofer, slow 4200RPM hard drive, low battery life and bottom gets very hot.